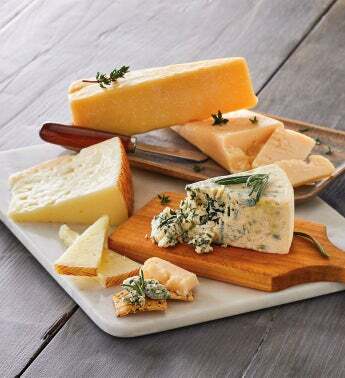 The Gourmet Cheese Assortment features thoughtfully selected premium cheeses from around the world. Manchego is a firm Spanish cheese made from sheep's milk aged up to two years. With its sharp flavor, it's wonderful on its own or on crackers. Buttery and full-bodied, Promontory is an Irish-style cheese with nuances of citrus and fruit. A multiple award-winning cheese, it pairs well with red wines, ales, and IPAs. Another award winner, St. Pete's Select blue cheese from Caves of Faribault, Minnesota is creamy and complex. Made by hand, this premium cheese is cave-aged for a minimum of 100 days. The gold-medal winning Sartori® BellaVitano Gold® cheese melds the taste of premium Parmesan with a buttery finish rich with nutty, fruity flavors. This gourmet cheese gift is perfect for easy entertaining or for anyone who loves artisanal cheese.